Patriarch; son of Gamaliel IV. and grandson of Judah II. 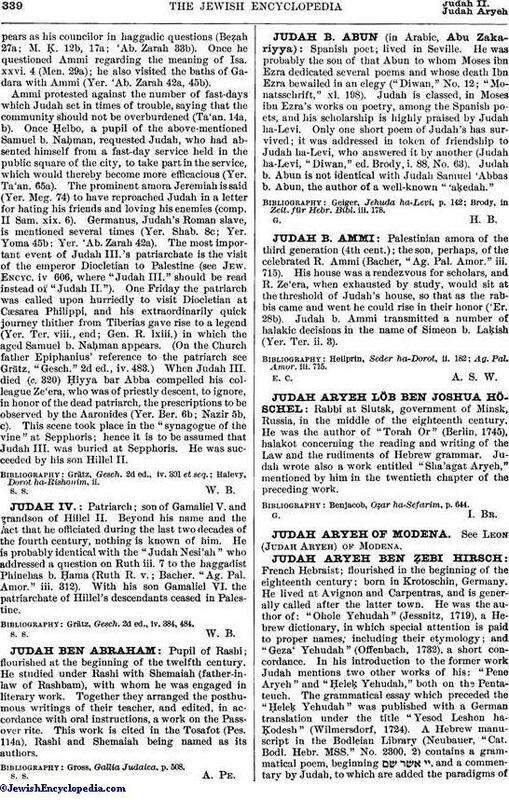 The sources do not distinguish between Judah II. 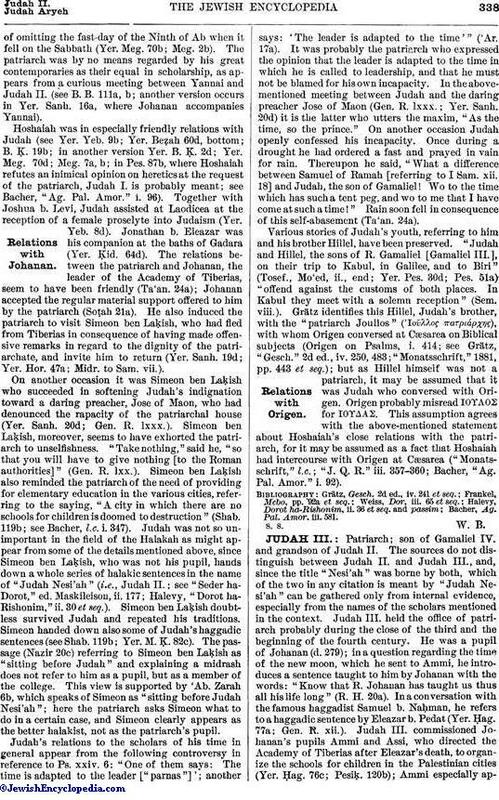 and Judah III., and, since the title "Nesi'ah" was borne by both, which of the two in any citation is meant by "Judah Nesi'ah" can be gathered only from internal evidence, especially from the names of the scholars mentioned in the context. Judah III. held the office of patriarch probably during the close of the third and the beginning of the fourth century. He was a pupil of Johanan (d. 279); in a question regarding the time of the new moon, which he sent to Ammi, he introduces a sentence taught to him by Johanan with the words: "Know that R. Johanan has taught us thus all his life long" (R. H. 20a). In a conversation with the famous haggadist Samuel b. Naḥman, he refers to a haggadic sentence by Eleazar b. Pedat (Yer. Ḥag. 77a; Gen. R. xii.). Judah III. commissioned Johanan's pupils Ammi and Assi, who directed the Academy of Tiberias after Eleazar's death, to organize the schools for children in the Palestinian cities (Yer. Ḥag. 76c; Pesiḳ. 120b); Ammi especially appearsas his councilor in haggadic questions (Beẓah 27a; M. Ḳ. 12b, 17a; 'Ab. Zarah 33b). Once he questioned Ammi regarding the meaning of Isa. xxvi. 4 (Men. 29a); he also visited the baths of Gadara with Ammi (Yer. 'Ab. Zarah 42a, 45b). Ammi protested against the number of fast-days which Judah set in times of trouble, saying that the community should not be overburdened (Ta'an. 14a, b). Once Ḥelbo, a pupil of the above-mentioned Samuel b. Naḥman, requested Judah, who had absented himself from a fast-day service held in the public square of the city, to take part in the service, which would thereby become more efficacious (Yer. Ta'an. 65a). The prominent amora Jeremiah is said (Yer. Meg. 74) to have reproached Judah in a letter for hating his friends and loving his enemies (comp. II Sam. xix. 6). Germanus, Judah's Roman slave, is mentioned several times (Yer. Shab. 8c; Yer. Yoma 45b. Yer. 'Ab. Zarah 42a). The most important event of Judah III. 's patriarchate is the visit of the emperor Diocletian to Palestine (see Jew. Encyc. iv. 606, where "Judah III." should be read instead of "Judah II."). One Friday the patriarch was called upon hurriedly to visit Diocletian at Cæsarea Philippi, and his extraordinarily quick journey thither from Tiberias gave rise to a legend (Yer. Ter. viii., end; Gen. R. lxiii.) in which the aged Samuel b. Naḥman appears. (On the Church father Epiphanius' reference to the patriarch see Grätz, "Gesch." 2d ed., iv. 483.) When Judah III. died (c. 320) Ḥiyya bar Abba compelled his colleague Ze'era, who was of priestly descent, to ignore, in honor of the dead patriarch, the prescriptions to be observed by the Aaronides (Yer. Ber. 6b; Nazir 5b, c). This scene took place in the "synagogue of the vine" at Sepphoris; hence it is to be assumed that Judah III. was buried at Sepphoris. He was succeeded by his son Hillel II.